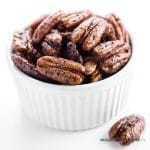 Learn how to make candied pecans in a slow cooker - it's easy! 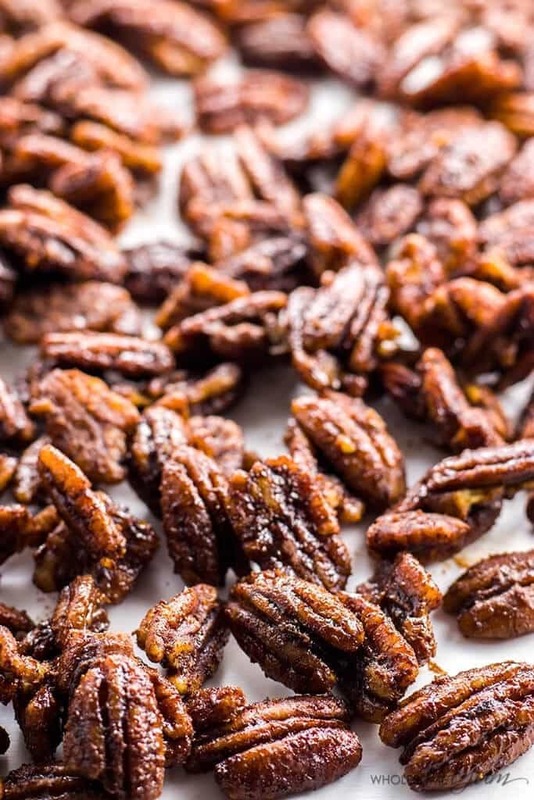 This sugar-free candied pecans recipe needs just 5 ingredients & a few minutes of prep time. This post is sponsored by Sukrin USA. All opinions are my own and I only share products I personally love. Thanks for supporting the brands that make this site possible! 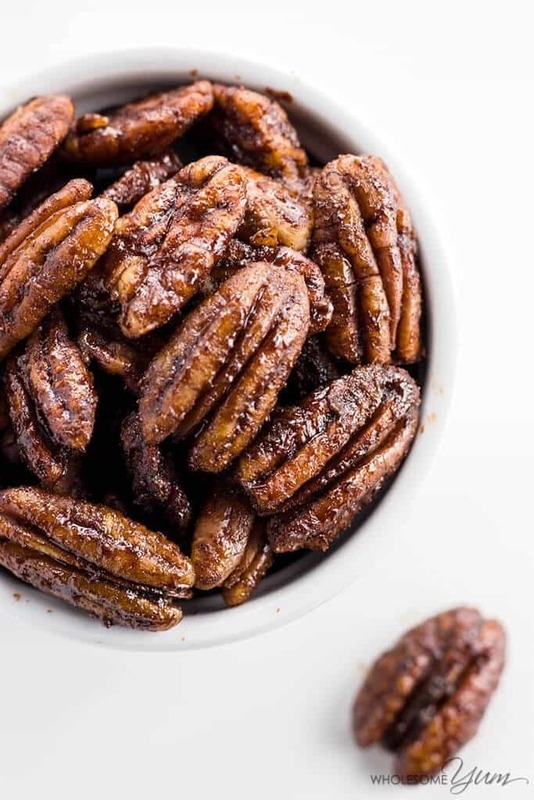 It’s been on my list for a while to come up with a recipe on how to make candied pecans in a slow cooker. I waited until the holiday season to do it, because I knew I’d want to incorporate them into holiday gifts. The part that came as a surprise, though, is that what started out as regular glazed nuts turned into a sugar-free candied pecans recipe. I’ve always been a sucker for homemade presents. They are so much more personal than anything store bought! And, it totally takes me back to my childhood. As a kid, I spent a lot of time drawing, crafting, and generally creating, so anything that involves those activities again is the best kind of nostalgia ever. I love every aspect of it – from the idea generation phase, to the crafty creation of the gift itself, to the pretty wrapping. I don’t have time to do it every year, but it makes me so happy when I get the chance. More recently, as my passion for food has grown, my ideas for homemade presents have likewise turned to (healthy) edible gifts. Their universality makes them a perfect option for any hard-to-shop-for friend, family member, or coworker on your list. And, they have a way of making the recipient feel so special, knowing you hand made something just for them. When the idea of glazed nuts as gifts first came to me, I figured that I’d be making a regular sugar-filled version. That would have been fine, since I’d be giving them away. Still, I was tempted to experiment to see if I could make a healthier, low carb version. When my sugar-free candied pecans recipe worked out, I was beyond excited! It started with my recent experiments with Sukrin Gold, which I’ve been trying out as a brown sugar substitute. 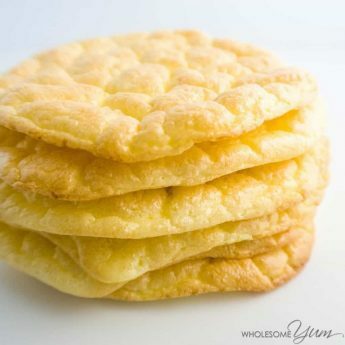 It has a very similar taste and consistency, but it’s sugar-free, gluten-free, and low carb. It’s also a natural product, which is important to me when choosing a sugar replacement. I’m happy to report that it worked out perfectly in this sugar-free candied pecans recipe. If you’re looking for another reason to make these low carb candied pecans in a Crockpot, they happen to be a healthy snack to have around at home. 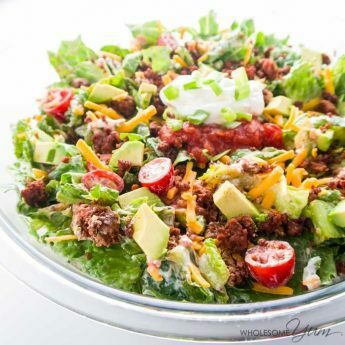 They are packed with protein, monounsaturated fat, and iron. Without the sugar, you can feel really good about eating them! When an occasional late night craving strikes for something crunchy, just a small handful does the trick. They are also convenient to have ready in portion-controlled sandwich bags, to take with you on the go. Then there’s the obvious use case – holiday gifts or a place on the holiday dessert table. I actually tripled this sugar-free candied pecans recipe on the final run. That way, I’d have two batches to give away as gifts and one to keep. We’ve already gone through most of our own, so it will be time to make more soon! Grease a 4 quart (4 L) slow cooker and place the pecans inside. In a small bowl, whisk together egg white and vanilla extract until it's foamy. Pour the mixture over the nuts and stir to coat all the nuts. 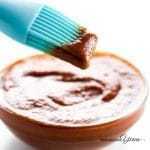 In a medium bowl, combine the Sukrin Gold and cinnamon. Evenly pour the mixture over the pecans and stir to coat all the nuts again. Cook on low for 3 hours, stirring at 20 minute intervals. In the last 20 minutes, stir in the water. When done cooking, arrange the nuts in a single layer on parchment paper to cool. If there are any clusters stuck together, you can break them apart after cooling. Store in an airtight container. Optional step: To make the nuts extra crispy, plus add a toasted aroma and taste, place them in a preheated oven at 400 degrees F (204 degrees C) for 4-7 minutes. I currently have this in the slow cooker and my entire house smells just amazing! I absolutely can’t wait until they are ready! I still have the water step to do, but I was wondering if you or anyone else has tried subbing it for something like bourbon. I’m pretty sure it would evaporate faster than water so I don’t want to mess up the batch, but it sounds like such a delicious addition. Thoughts? And p.s…thank you so much for the recipe! Hi Vicky, Thank you! I haven’t tried that. Let me know how it goes if you try it! These have become our go-to sweet snack. We love them. I’ve used regular monk fruit and today I’m cooking it with golden monk fruit (don’t have sukrin). I’m also adding walnuts with my pecans today. I sprinkled it with a few tsps of ground flax seed to sneak that in the diet. I’m guessing nobody will even notice since these taste so amazing. Thanks so much!!! I made these and am so happy with how they turned out. 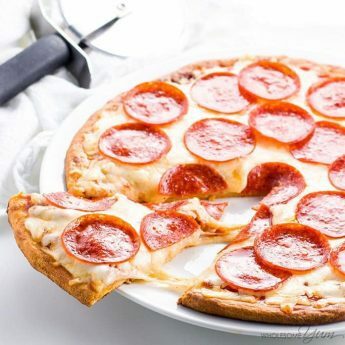 I have tried making several keto recipes, and prior to this experience, all my keto recipe attempts have all been fails. I never know if it is an error/oversight on my part or if I just don’t have the keto taste buds. For this recipe, I used xylitol mixes with a tap blackstrap molasses because I don’t have Sukrin Gold. I initially only baked, at the end, for 5 minutes but the next day, about 14 hours after I set them out to “dry”, they were still a little sticky so I popped them back in the oven at 400° for an additional 2 minutes, then let them cool/ dry some more. They turned out great! 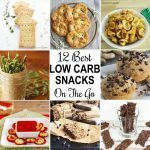 Thanks for the great sugar-free snack, I have been incorporating 1/4c into my keto diet since I made them. OMG – these are to die for! Been on keto for two months and havent anything this good since starting! So…. I ended up with a crock pot full of burnt pecans and much frustration. Followed recipe. ??? Hi Jenn, The Crock Pot should not burn them. Either yours runs hot, or you didn’t stir them enough, or both. I do not have Sukrin gold presently. Will Monkfruit or another sweetener work? Yes, you can use another sweetener. Sukrin Gold just has more of that “brown sugar” flavor. Let me start with, these are amazing! The sweetness is perfectly mild, not cloyingly sweet like you find at those kiosks so you retain the flavor of the nut. I made as instructed with 2 changes. I added a tsp of sea salt and when adding the water for the last 20 minutes, I left the lid off to let the steam escape and then roasted for 5 minutes. They were so amazing I had to try almonds. Without even cleaning the crockpot, I made another batch with almonds and they are equally incredible. I’m so grateful to be able to give my friends and family this sweet sugar-free treat. Thank you! Can you use truvia baking blend brown sugar like sukrin gold? I want to make ‘sugared’ nuts for Christmas and don’t want to have everyone suffering tummy problems from eating them! Hi Nancy, Yes, you can. They would not be sugar-free, but still lower in sugar than regular candied nuts. 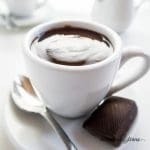 Otherwise, be aware that erythritol is different from sugar alcohols and doesn’t usually cause tummy issues in most people (unlike other sugar alcohols which often do), but of course it’s up to you! My friend is allergic to pecans. Has anyone tried this with cashews or almonds? Hi Rose, I haven’t but you can definitely do it with any nuts you like. Have you tried this in your Instant Pot? If so, what are the adjustments to time, etc? Hi Ann, Sorry, I haven’t tried these in an Instant Pot yet. I’m sure it would work, just can’t specify times before trying it. Let me know if you make these! Hi! I made three giant batches of the candied pecans… Too many for sure but delicious. I gave some away but still have a lot left. How can I store them long term? Would they freeze? So yummy but I need to keep the temptation at a distance! Hi Lori, Yay, I’m so glad you made so many! You can store them in an airtight container in the pantry for a while, at least a couple weeks, and yes, you can freeze them for longer, too. I’ve never heard of Surkin Gold. Does it have an after taste? What is it? I would love to know more about it, and your experience with it. I know some people are concerned about using Splenda, but it’s a way of life for me, trying to control my weight and pre-diabetes. Can you use Splenda in this recipe, too? Hi Xenia, I love Sukrin Gold and it does not have an aftertaste. It’s made with a natural sugar-free sweetener called erythritol. Check my sweetener guide for more info on that. You can make this with Splenda, but I recommend natural sugar-free sweeteners over artificial. What is the purpose of adding the water? Hi Peggy, The water is needed for the right consistency. The ingredients say 1/4 cup water and the instructions say nothing about water, so I need it or no, and if so when do I add it? Hi Rebecca, The water is mentioned at the end of step 4 on the recipe card instructions. These are amazing. I prepared them in the oven following your instructions from another comment. I used 1/2 cup of pyure stevia and erythritol mix, because I didn’t have any sukrin. They turned out perfect. When my dad tried them he couldn’t tell the difference from the ones we used to buy at the mall! Thank you, Sara! I’m so glad you liked them! I have two bottles of the Sukrin Gold liquid, could I use that instead of the granulated? If so, would it be the same amount? Hi Lori, I haven’t tried this with liquid Sukrin Gold. I think it would work. Let me know how it goes if you try! Please confirm: You put the nuts in the oven to toast AFTER the slow cooker? And do you put the lid on the slow cooker or cook them with the lid off? Hi Lulu, yes, you spread the pecans out on a baking sheet after they’ve been in the slow cooker for three hours with the lid on. Thank you, Sandy! Yes, a larger slow cooker should work fine. 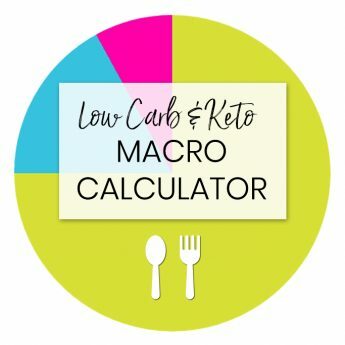 Would you recommend adding any butter for a low carb high fat diet? Hi Amy, No, it’s not necessary. Pecans are already naturally high in (healthy) fat. The nutrition info for the sugar-free candied pecans is listed on the recipe card. I finally got my Sukrin Gold and was so excited to make this that I wasn’t willing to wait for an answer. Do you pack the Sukrin when measuring like you would with regular brown sugar? I lightly packed it but it still seemed like a lot of sugar. Plus gets extra pricey quick. If you were to measure it in grams what would be the total to use? Thanks in advance, your recipes are scrumptious. It’s going to be a long 3 hours. Hi Jani, I didn’t explicitly pack the Sukrin Gold in the measuring cup, but it naturally settled fairly tightly in there for me. A teaspoon of Sukrin Gold is 5 grams, so 1 cup would be approximately 240 grams. Slight variations shouldn’t make much difference for this recipe. 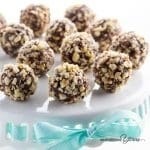 Either way, it’s still less sweetener than typical candied pecan recipes made with sugar (most use 1.5 cups sugar for 3-4 cups pecans, whereas this recipe uses 1 cup Sukrin Gold for 4 cups pecans). I hope you enjoyed the sugar-free candied pecans – I’d love to hear what you thought of them! Thanks so much for making all these delicious recipes available! Would Lakanto Golden be a possible alternative or is Sukrin a must on these? You’re welcome! I haven’t tried it with Lakanto Golden but it should work. 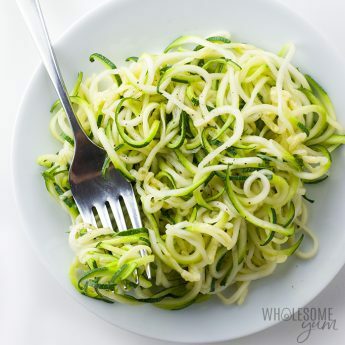 I love how easy and healthy this is! I love these candied pecans on everything! Can I make these in a regular oven? Yes, you can! You’ll need to use a large rimmed baking pan instead of the slow cooker. Instead of step 4, preheat the oven to 250 degrees F and bake for one hour, stirring every 15 minutes. After an hour, add the water and cook for another 15 minutes. If you want them to have a toasted flavor, you’ll still want to do the optional last step in the oven, as well. Let me know how they turn out if you try it! I’m new to the whole low carb life and love my sweets but am very sensitive to the aftertaste of sugar alternatives, but I have to say I LOVE THESE PECANS. I’m thinking about doing this with several types of nuts. I actually mixed half sukrin gold with a little less than half Truvia and it still turned out AWESOME ! I spent many years in the South and spiced pecans and candied pecans were always expected during the holidays. I love that this is made in a crock pot. I think the Sukrin Gold is amazing. Good choice. Question: what do you consider a serving? A serving of these is 1/4 cup. Thanks! 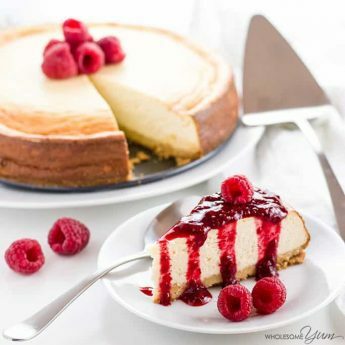 Great recipe – they look delish!